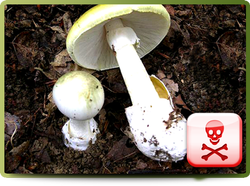 The Death Cap mushroom is one of the most dangerous mushrooms. 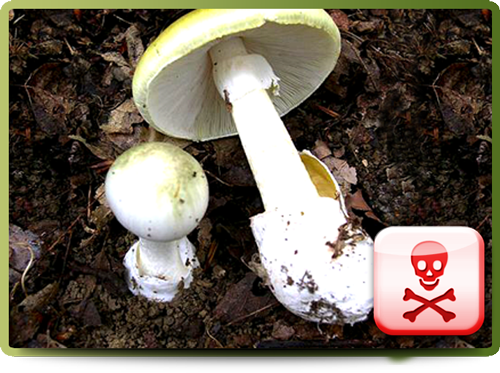 The toxins from this mushroom attacks your liver and kidneys. The cap is pale yellow to light olive in colour and grows from 5 to 15 centimeters in diameter. The gills are white and the spore print is also white. The stipe grows from 8 to 15 centimeters tall and from 1 to 2 centimeters thick. The viel/annulus is visible below the cap. There is also a volva at the base of the stipe. Be sure to remove debris at the base of this mushroom to check for the volva, as it is one of the distinguishing markings of this dangerous mushroom.